« Vole Damage to Fruit Trees – has anyone else suffered this problem? Apple Chimeras – information please? Having purchased a bag of Royal Gala French apples from my local supermarket about 10 days ago, I was surprised to find what appears to be a double variety apple otherwise known as a chimera. 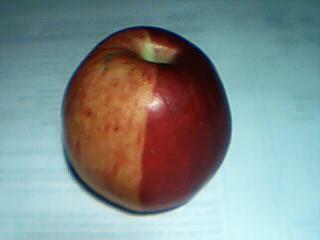 The apple is half flushed and half striped, a perfect half as though it had been dipped in dye, truly amazing. Has anyone else come across one of these? Chimeral stripes or sections occur from time to time in the fruit of varieties selected, usually, from a bud sport. A mutation can occur in the apical cells of a bud, and this mutation may be expressed in the fruit of the branch that has grown from the mutated bud. It may produce fruit of somewhat different appearance from the rest of the fruit on the tree. These chimeral fruits may be more attractive – for example, red all over rather than a mere flush of red. Growers often attempt to conserve the mutation. Graft wood is taken from the branch to propagate trees with the mutated more highly coloured fruit. If the mutation proves stable – consistently producing more highly coloured fruit – it can be registered as a new named variety, as in the case of Royal Gala. 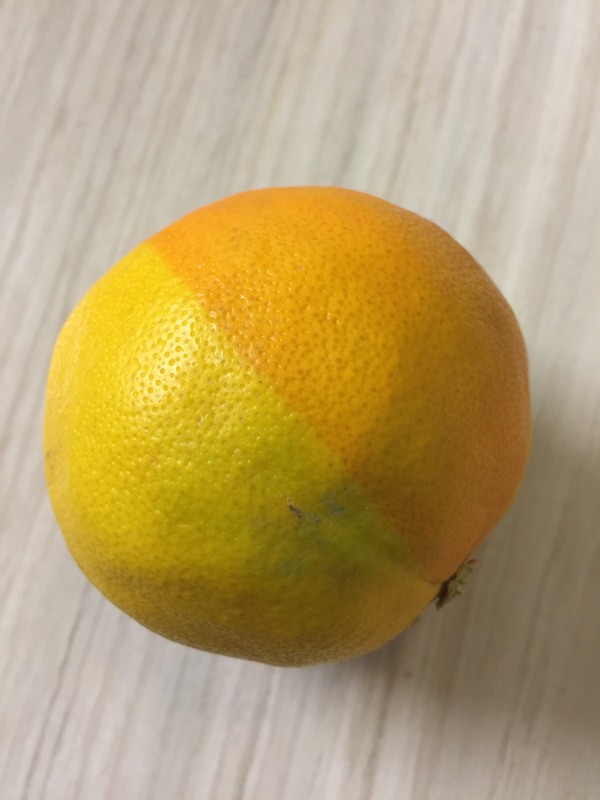 The pale stripes or sections seen in chimeral fruits are the result of a reversion to the colour of the parent fruit and are an indication of the instability of the mutation. One can see this easily in the sport of Miller’s Seedling, known as Red Miller, in the picture above. The fruit of Miller’s Seedling is cream mottled with pinky red, while Red Miller is red all over. The Red Miller with the cream chimeral stripe is reverting to the original cream and pink Miller’s Seedling; similarly in the Queen Cox and the Royal Gala. 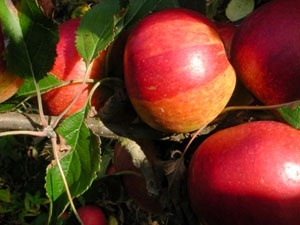 Many named varieties have been selected from bud sports of the popular commercial varieties: for example, Delicious, Cox’s Orange Pippin, Jonagold and Gala. The mutation may affect only the fruit colour or skin texture (it may be russetted whereas that of the parent variety is smooth) and genetic fingerprinting techniques where the DNA is extracted from the leaves, will not distinguish the parent variety from the derived variety. Many examples of named mutation varieties are conserved in the National Fruit Collection at Brogdale – Golden Delicious, Cox’s Orange Pippin and Jonagold each have over 20 varieties. I have seen this phenomenon twice, this year on Gala, just like in the photo and also some years back on a russet apple, Princesse, which had developed two separate non-russetted segments. The interest was mainly in the flavour. The non-russetted portions were distinctly sweeter than the bulk of the fruit, having some of that sere dry flavour of a typical russet. 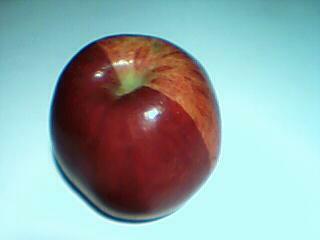 This apple had come from a commercial orchard and only a single tree had developed the chimera on a few fruits. Princesse had developed spontaneously from King of the Pippins, which is a clear skinned apple with a slightly russetted basin, grown in England and France since at least the 18th century. It has been long known that russet improves flavour in an apple. 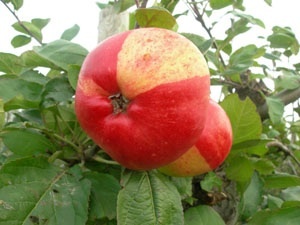 Cox is an example of a partly russetted apple when grown naturally, but today’s supermarket Cox has had the russet removed in the spring by sprays. The philosophy is that the public either want a russet or a clear skinned apple. Just one reason why supermarket Cox does not have the flavour it once had. A chimera is a plant with two genetically distinct tissues in the same plant, named after the animal of classical mythology made up of different animals. They can originate in a number of ways so that the whole plant can be a chimera or just part of it. A typical whole plant is a variegated plant in your garden. The growing tip of each shoot has a tiny cluster of rapidly dividing cells, the meristem. This apical meristem is arranged in layers that rarely intermingle so if one layer develops a mutation in the chloroplasts (small bodies in each cell that carry the chlorophyll) this layer stays white, yellow or pale green. As the shoot grows the cell layers develop into coloured edges or centres of the leaf. The variegated apple as a single fruit will be caused by the mutation of a gene for colour at a very early stage of the flower development. If it is two halves in different colours it is probably at the two cell stage and if it is quartered it is probably at the four cell stage. If the whole shoot has a new colour variety the mutation has occurred earlier on in the development process and the shoot can be propagated as a new cultivar. As Alison says, the striping may indicate instability of the mutation. Some genes are unstable because of ‘transposons’ – sequences of DNA that can ‘jump’ in and out of genes disrupting their natural function; however, I do not know that anyone has demonstrated ‘transposons’ in apple fruit colour genes. I imagine it is also possible that the striping may indicate instability in the integrity of the outer cell layers. Suppose a red apple sport is itself a periclinal chimera with a genetically ‘dark red’ layer, contributing to skin colour, and an adjacent genetically ‘pale red’ layer. If a cell moves from the ‘pale red’ layer to the ‘dark red layer’ the resulting cell lineage may result in a pale red stripe, a sectoral chimera, appearing as if there has been a new mutation . There is a good book on the subject – ‘Plant Chimeras’ by A. E. Tilney-Bassett. 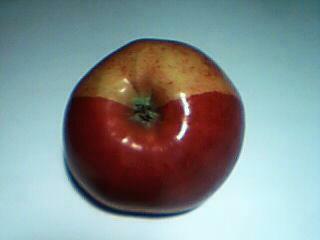 I have a Chimera apple bought from Costco. A bag of Red Delicious. It was exciting to find it. At first I thought I was looking at the same side and then I realized there was a stripe on both sides. Red with yellow stripes. 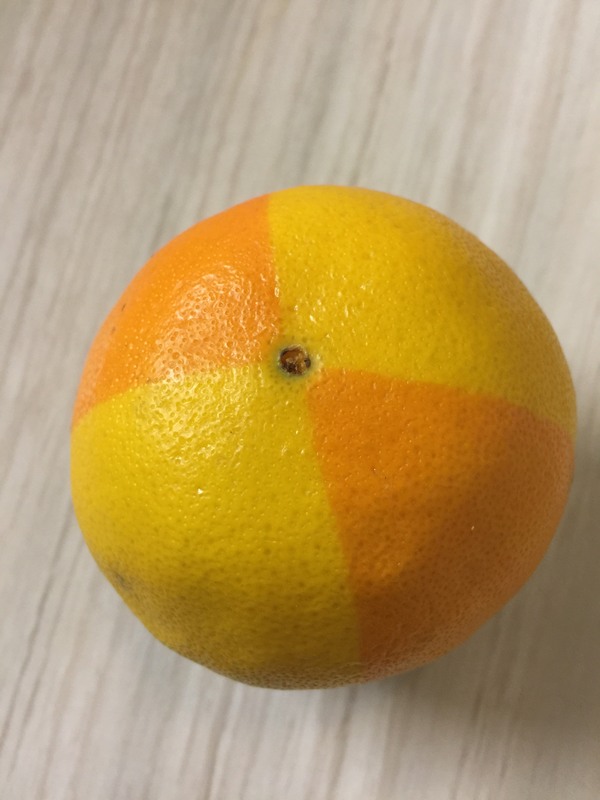 I just found this chimera orange – the only one out of the whole box! 1/4 orange then 1/4 yellow then 1/4 orange then 1/4 yellow with perfectly straight divisions between colours. Picture posted in the main piece above.